One demonstration of early life in the settling of Texas that is always a hit at the Heritage Fest & Muziky is the running of the 1890's saw mill. To make it more interesting, the Fest organizers try to run all the demonstrations with period power equipment. 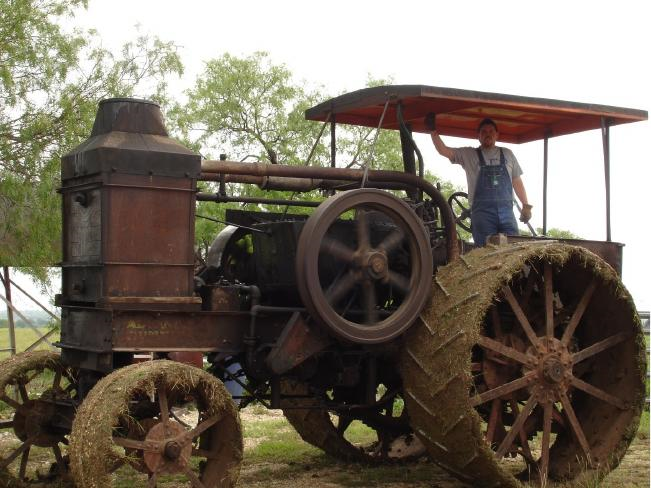 This year, on Saturday, October 21, the Zapalac Saw Mill will be operated by a 1921 Rumely Oil Pull 30-60 Model “E,” owned and operated by the Buice Family of Waco, Texas. This behemoth tractor measures over 18 ft. long, 10 ft. wide, and 12-ft. tall and weighs 26,000 lbs. It will be a sight to see as it thunders across the TCHCC grounds. Rumely Oil Pull had one of the most respected engines in farm tractors. This tractor offered three features that earned it this reputation. It was reliable, more powerful than rated, and used cheap fuel--kerosene. The Rumely Model “E” was built from 1911 to 1923. It was rated to have 30 drawbar and 60 belt horsepower. The two-cylinder engine measured 10 in. by 12 in., bore and stroke, and operated at 375 RPM. In 1918, the tractor sold new for $4,300. In 1939, Bud and Lyman Knapp purchased this Rumely, number 2372, and a Rumely fuel wagon from a Mr. Babbs in Blackwell, Oklahoma. The tractor and fuel wagon were always stored inside. The price was $90.00 for the tractor which was cheap, big power. Not only did this 30-60 turn the soil on the Knapp Farms in Kay County, Oklahoma, but during WWII helped build a concentration camp at Tonkawa, Oklahoma that housed war prisoners. Post war, she was used to pack trash at an Oklahoma landfill. After her work days, she spent most of her time as a show piece at the Oklahoma Steam Threshing and Gas Engine Association in Pawnee, Oklahoma before making the trek to Texas. The E was converted from its original make-and-break ignition system to a high-tension magneto with spark plugs sometime in the 1950s. Last year, it was converted back to its original ignition system, which has made the tractor crank and run much smoother. Almost everything on this tractor is original from the factory, and still operates 96 years later!